A volunteer harvesting fresh rhubarb. 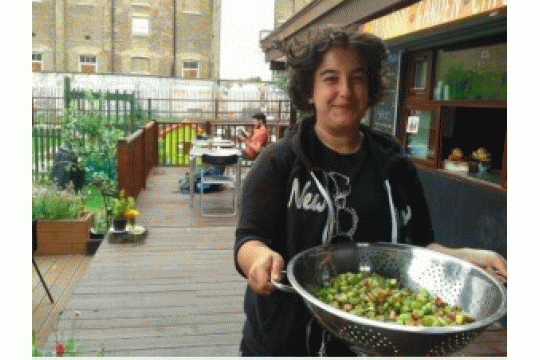 Our community centre and garden help local people meet and support one another. We promote physical activity, healthy lifestyles and social interaction for Camden residents and visitors. Our supported volunteer and training programme helps adults with learning difficulties and mental health issues learn new skills. 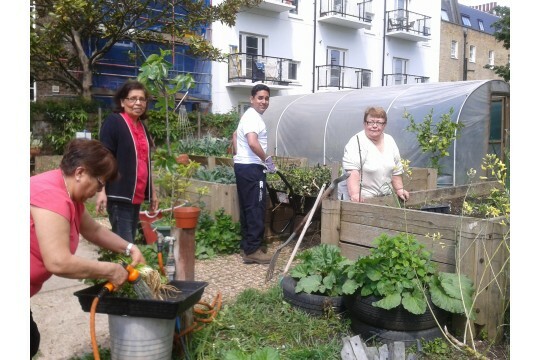 Allotment space is provided to 24 families including a Bengali women's group and older people's group. Our five-a-side Futsal pitch is used by over 500 young people, many taking part in courses to move into further education or employment. Our weekend play programme enables children aged 5 - 14 to participate in supervised activities. would buy table tennis and arts equipment for children's play activities. would support our creche that helps parents return to work. would provide local families in need with children's weekend activities.